There are some terrific fantasy writers out there at the moment: Joe Abercrombie, Scott Lynch, Patrick Rothfuss, Trudi Canavan, and of course GRR Martin – to name but a few. Doubtless in days to come many future authors in the genre will talk about how the above names influenced their own work. And that the early 21st century was a terrific time for the fantasy genre – and they’d be right too. But, as a grizzled 54-year-old ex soldier/trucker, real-ale guzzler I look back to the halcyon days of the 70’s and 80’s, and occasionally the early 90’s for inspiration and word magic surrounding the fantasy arena. Thus, while in rare nostalgic mood, I have chosen twelve of my favorite reads in the genre, and have listed them below. Please let me know if you agree with my thoughts on each work, or if you had other awesome influences at that time. Verdict: stirring, gritty and volatile. Some very moving scenes. I haven’t found many books focusing on Germanic myth. This was a pleasant surprise. Grundy’s saga is pretty much a retelling, in layman’s terms, of Wagner’s Ring Cycle that in itself, based on the Teutonic poem The Nibelungelied. An old legend surrounding hero Siegfried, his beloved Brunhilde, (spellings vary throughout) the traitor Hagen and, mixed into that brittle triangle – the gods: Loki and Woden, and the ill-fated Fafnir and Regin (dragon and dwarf – both, one can imagine, heavily influenced Tolkien’s The Hobbit). Stephen Grundy brings this dark bellicose myth alive in his thrilling narrative. Anyone who likes the TV series Vikings should give this a try. Verdict:, epic and stirring yarn stitched to a gritty Norse canvas. This is the first of 4 books featuring Severian the Headsman. It’s beautifully written and unlike any other fantasy novel/series I have come across. Set in a pseudo medieval/future, it’s content is dark, rich, vibrant and weirdly heroic, with wonderful descriptions of characters and places. Wolfe’s sympathetic portrayal of Severian, showing his anguish/dilemmas and ranging rovings across the realm, left a lasting imprint on my mind. A complicated twisted tale that stood well out from the many ‘hero verses villain’ sagas around in those days. A must read for those who like the darker side of fantasy. Verdict: darkly imaginative, weirdly gothic and richly twisted in content. There is real magic here! A trilogy framed loosely around Arthurian Myth, Lyonesse takes you on an enchanting journey through tangled forests and stark heights, and then plunges you into weird otherworldly realms where only accomplished warlocks dare tread. For me its colorful content captured the mystery and magic surrounding British/Irish folklore. Encountering the many wonderful and equally hideous denizens of the Forest of Tantrevalles was a particular joy for me, whilst delving through this evocative series. A Midsummer Night’s Dream on stilts. Verdict; A must for lovers of mystery, myth, weirdness, faeries and Arthurian Romance. The (first) Chronicles of Thomas Covenant the Unbeliever form three powerful fantasy epics based on leper and cynic, Thomas Covenant. The aforementioned finds himself thrust into a mirror-realm after a fall, and dismisses everything he sees as an illusion – hence his title The Unbeliever. One wearies of Covenant’s character, (we’re supposed to) as he doggedly rebuffs and rebukes all who try to help him, despite his potency returning in this vividly healthy realm (The Land). Here Covenant is exalted and has real power via the white gold wedding ring he wears. The first and second series’ (I’ve not read the third yet) are beautifully written, stirring, and a touch on the dark side. Donaldson’s characters range from selflessly heroic – the giant Saltheart Foamfollower, The Bloodguard, to menacing and sinister – The Ur-Viles and the chilling shapeshifting, soul stealing, Ravers – who menace the pages as Lord Foul’s prime movers. Verdict: a rich and intelligent series of books, highly individual and a giant amongst its peers. I remember walking down a street in Hastings, England, and seeing this book in a window. Must have been around 1984 ish. The author, David Gemmell was a reporter for the local paper, and he’d just written this fantasy book called Legend, which would shortly launch him as one of the most successful and prolific fantasy writers during the 80/90’s. I remember being so excited that a guy who lived around the corner had written this book in my favorite genre. And what a terrific tale it was! Simplistic in plot, but refreshingly new, and oozing with energy and strong forceful characters. Druss The Legend comes out of retirement to save the Drenai race form Nadir invaders at the invincible fortress of Dross Delnoch. Verdict: great battle scenes, engaging characters and gritty dialogue. A bloody good read! Verdict: complex yet simplistic, noble, wise and soul reaching. A harrowingly beautiful book. Moorcock was big in the 70’s when I was a troubled teen. He was prolific and produced a heady catalogue of ‘Science Fantasy’ books. I didn’t like them all, but some I loved. Most my preferred ones featured The Eternal Champion – a doomed immortal hero sentenced to fight chaos/evil throughout eternity, whilst enduring loss amid changing faces and identity. My particular favorite was the Swords trilogy starting with The Knight of the Swords. I read this whilst on a sleeper train betwixt Inverness and London ( apropos – I ‘d been on an Outward Bound course in north-west Scotland and was heading home) The Knight of the Swords and its sequels were vivid and violent, overflowing with twisted sorcery and powerful imagery. The trilogy and (following one) surrounded Prince Corum of the Scarlet Robe – a noble elf type and one of the many faces of the Eternal Champion. Again this is loosely set to a pre-Arthurian backdrop. 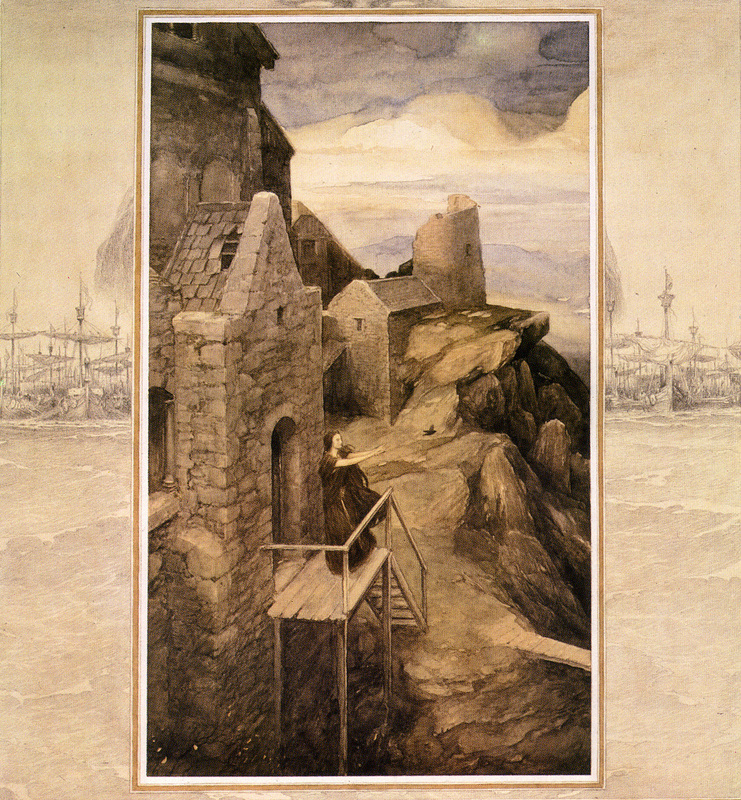 There are similarities with Lyonesse – though the books are miles apart in content and style. Verdict: dark, weird, wonderfully descriptive and moody. Guy Kay worked on The Silmarillion after Tolkien’s death. He has written some great fantasy books, most set to pseudo-medieval European tapestries. The first was Tigana. This is a huge book, and by that I mean the story is barnstorming good! There are grand and beautiful moments, which reflect Tolkien’s works. But the best thing about this book is the fast-paced flawless plotting and hauntingly magic scenes Guy Kay reveals. Tigana tells of a sub-continent ripped in two by rival sorcerers, and the valiant, clever struggle for freedom, by a group of traveling songsters: their perilous quest to bring both enemies down at the same time. Verdict: a brilliant epic with more twists than a curly-whirly. I really couldn’t put this down! The entire First Age of Middle Earth in one book! The Silmarillion is The Epic – nothing else compares. It’s a tour de force, spanning even elf lifetimes and, though it reads flawlessly as one novel, there are many great individual sagas wrapped neatly within. The lay of Luthien and Beren being one, The Tale of Turin Turambar, another. The latter did recently make it as an independent book, and so it deserves to be. The Silmarillion is biblical in scale. It’s vast, both noble and tragic in content, focusing (in the main) on the valiant arrival of the Quendi (High Elves), who seek vengeance against the first Dark Lord – Morgoth ‘to whom Sauron was only a servant’ for stealing the jewels known as the Silmarils. Verdict: mythic grandeur on steroids. A fantasy burrito with not a cheerful Hobbit in sight! I found a Del Rey copy of this in a scruffy bookshop in 1978, whilst working on a Dutch building site near Den Haag. ‘I was just a skinny lad’ and stuffed my nose in this cheese-smelly copy whilst the fellow workers consumed their raw herrings whole, before climbing the mile-high scaffold and starting the days work. Poul Anderson wrote a ton of SF books, back then. But he also penned some brilliant fantasy novels, based around Scandinavian myth. Hrolf Kraki’s Saga was a stark retelling of an old Danish legend with links to the English poem Beowulf, and Shakespeare’s Hamlet. A rugged, surging tale and my #13, btw. Then there is The Broken Sword. It reads like a lit fuse, devouring its content and characters until exploding with ruinous death and carnage at the end. Awesome! There is such energy here! Upshot on plot: Scafloc (a mortal bairn) is stolen at birth and swapped with a changeling, Valgard (half elf half troll = nasty combination) to ruinous outcome. Said thief, Imric the Elf Earl raises Scafloc as a warrior to use steel (Norse elves, unlike Tolkien’s, cannot touch or tolerate steel or iron) against their bitter foes the trolls. But Scafloc’s doppelgänger Valgard is himself recruited by the trolls – hence the two ‘twins’ become bitter foes. Thrown into this violent mix is Freda, Scafloc’s sister, whom he saves from the trolls and unwittingly beds to disastrous outcome. Verdict: savage and relentless, laced with dark myth and haunting norse magic. A fantasy classic! Needs no introduction. I read this weighty tome over and over, even many times on board a rescue boat at sea, whilst my dad hauled in woebegone sailors that had capsized during dinghy races – silly buggers. As C S Lewis wrote on the subject ‘It is almost beggar’s parallel.’ What more can I add. Except to say that I can still open those first three chapters and find myself with Frodo, Sam and Pippin, as they leave Hobbiton that quiet autumn eve. I’ll hide with them from that first Black Rider as he turns the dusky corner in the road. And I can watch wide-eyed with Sam as his master talks to Gildor the elf in Woody End. Yes, there are the movies, and I’m a big fan of what Jackson produced. But the books are where it’s really at, man! Enough said! Hence The Lord of the Rings tops my delectable dozen. But let me know what you think, dearest reader! Am I right or am I wrong? As the guy in The Clash once said.